Camp Sequoyah: (AKA: Frank Spain Scout Reservation), operated by Greater Alabama Council ( BSA), is nestled among 1,447 acres for woodlands in east central Alabama, near Cheaha State Park. 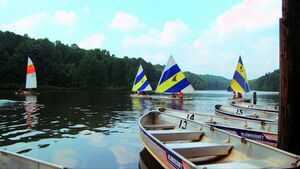 During summer camp, the centerpiece of Sequoyah is its 80-acre lake. Lake Cross provides the finest in boating, kayaking, canoeing, swimming and other fun-filled aquatic activities, including the addition of a high-speed water slide. The Butler Dining Hall provides great food for the summer in a family style setting. Five weeks of traditional Scout Camp is offered at Sequoyah each summer. Troops, youth groups and families may also enjoy weekend camping at Sequoyah throughout the year. Camp Sequoyah has been in operation since it was dedicated on June 29, 1972 and is a part of the Frank Spain Scout Reservation, which encompasses 1,447 acres. Camp Sequoyah has plenty of opportunities for advancement with four merit badge opportunity periods each day. Most of the afternoon is left free for troops to schedule their own programs or take advantage of the great activities planned by the camp. Lake Cross - 80-Acre Lake Aquatics Facility - Lake Cross provides the finest in boating, kayaking, canoeing, swimming and other fun-filled aquatic activities, including the addition of a high-speed water slide. 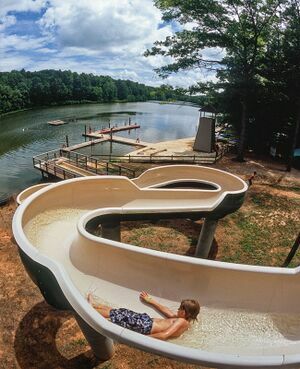 Sequoyah Sidewinder - a high-speed waterslide that takes Scouts on a wild ride. Cheaha State Park, Highest Point in Alabama, is a 2719 mountain-top wilderness preserve. Facilities include a 30-unit resort inn, restaurant, vacation cottages, chalets, modern campground, picnic areas, biking trails, hiking trails and lots of beautiful scenery. One of the most popular destinations in the state park system. Trailhead to many of the best state hiking trails. Located just 10 miles from this camp. Anniston History Museums includes the Berman Museum of ancient world treasures, Natural History Museum, and several military warfare museums. Located less than 10 miles from this camp. Scouting Magazine Dec 2015 - Guide to Cool Scout Camps - Camp Sequoyah Alabama. This page was last edited on 13 January 2018, at 20:34.